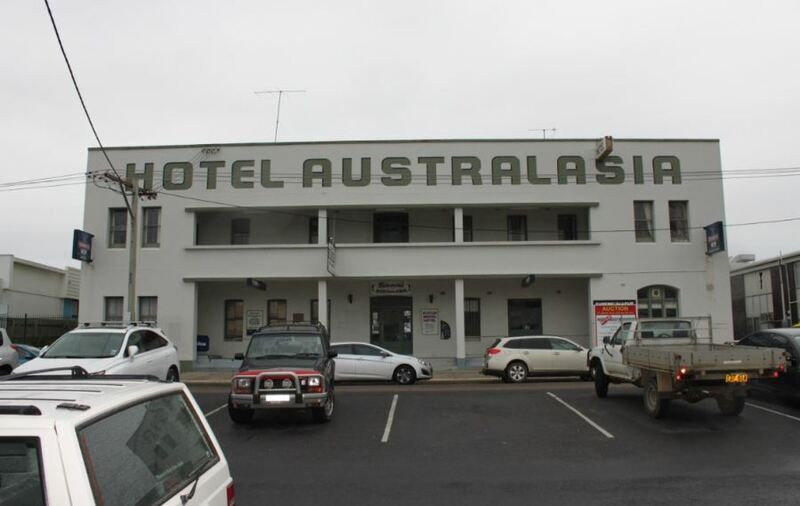 The sale of Eden’s historic Hotel Australasia is still on the table with Bega Valley Shire Council about to start negotiations with another potential buyer. The future of the much-loved watering hole on Imlay Street was back before Councillors this week, and while Council is split on how to move the project forward the idea of selling the building is still alive. Councillors Dodds, Griff, Tapscott, and Seckold argued that Council needed to explore other funding options before selling – including heritage and cultural grants. However, Councillors McBain, Nadin, Fitzpatrick, Bain, and Allen stuck with the Council’s previously agreed position that the building should be sold and that a private developer rather than Council is best at realising the potential of the 114-year-old building. Angela George from the Eden’s Australasia lobby group says she is disappointed other funding avenues have been stimmed by the flux around the project. “We have been hamstrung for the last two years, and in that time the community could have applied for around $3 million in funding, that would have been a very good start for the project,” Ms George says. Coinciding with the first Council meeting of 2019 is a commitment from the NSW Labor candidate for Bega, Leanne Atkinson. 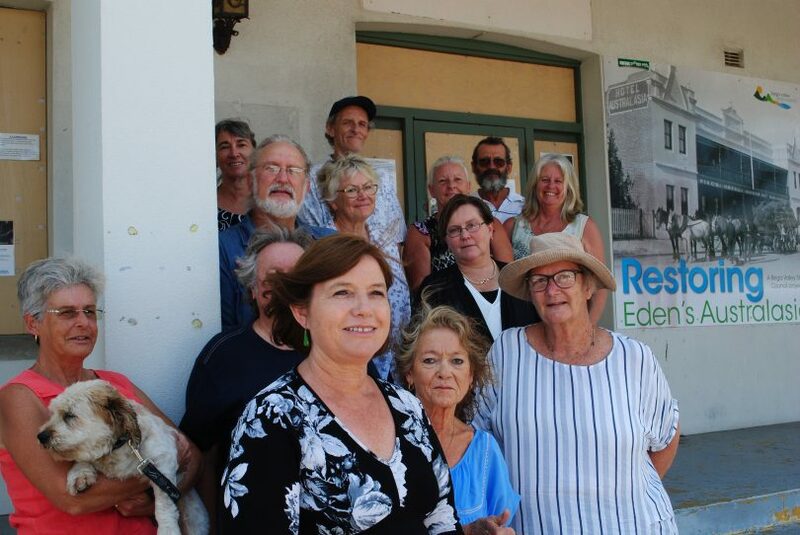 “Today I offered Bega Valley Shire Council a one-off $1.5 million grant towards the cost of restoring the historic Hotel Australasia on Eden’s main street,” Ms Atkinson says. “That matched funding from council can include in-kind contributions such as design work, material, or the provision of staff or equipment. “Any additional costs above the value of the grant will need to be met from other sources,” Ms Atkinson says. Labor’s Leanne Atkinson with members of the Eden’s Australasia lobby group. Photo: Supplied. Bega Valley Mayor, Kristy McBain says while Councilors were briefed about Labor’s commitment prior to this week’s meeting, not much can be done until the outcome of the March 23 NSW Election is known. “The resolution of Council was to go into negotiations with the offer that is currently on the table, the General Manager and I will now proceed on that basis,” Cr McBain says. The Mayor wouldn’t be drawn on who the interested party is or if they had been involved in the six-year saga previously. Council spent $500,000 to purchase the building, saving it from demolition, however, the Mayor remains tight-lipped on a possible sale price. “We are not just talking about the monetary value, we are talking about what the value of the site will be to Eden in the long run,” Cr McBain says. Cr McBain says Council’s expectations of the new owner are the same as they have always been – that the laneway access off Imlay Streeet be retained and the restoration of the 1920’s facade. Negotiations with Irisha and Rubycove Pty Ltd broke down in July last year, at which point Council invited Eden real estate agents to test the market, work that has resulted in this new offer. At the time Irisha and Rubycove talked about developing an international hotel on the site. 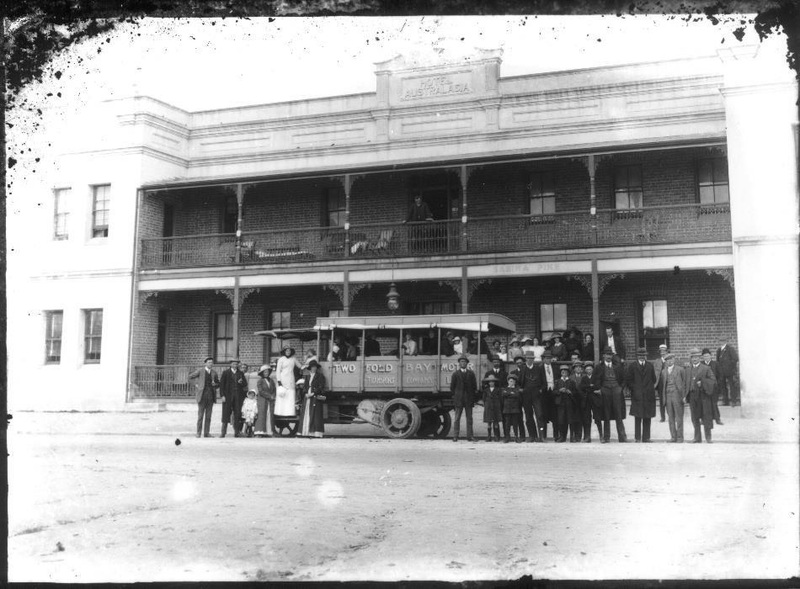 The historic facade of the Hotel Australasia in Eden, 1920’s. Photo: The Australasia Facebook. The Mayor says those she is about to start negotiations with are interested in restoring the building and that she is looking forward to understanding their vision and plans for the site in more detail. The last beer was served in 2010 and without a dedicated purpose, the building has increasingly become an eye-sore in the heart of Eden’s CBD. “We are keen to bring conclusion to this as soon as possible,” Cr McBain says. Ms George and the Eden’s Australasia group remain forever hopeful. “We all want an outcome, we will work with anyone who has the future of the building at heart,” she says. It is unacceptable that on the same that day that a grant offer of $1.5 million was made, five councillors voted to sell the Australasia at a finanical loss without any council discussion of the grant. We look forward to the building being restored, repurposed and once again becoming the centrepiece of the street scape. This significant building in our main street is definitely worth preserving; and that will be very evident as the 1950's facade is removed and the magnificent original frontage is revealed, and when people have access again to the beautiful interior. It is somewhat puzzling to me that while BVSC has possession of the property that they don't subdivide the lane way and the large portion of land at the rear (adjacent to the existing car park) , and retain that for extra parking space and public access from the parking area to Imlay St. Only council can explain that.